Aluminum Oxide is a tough, hard material often referred to by a number of other names including, Alumina, and Corundum. With a Mohs hardness of 9, Aluminum Oxide is a high strength, wear-resistant material possessing a strong ability to resist vigorous chemical attacks (such as acid and alkali) at extreme temperatures. Its high degree of refractoriness, along with its superior electrical insulating properties, dielectric properties, and high melting point make Aluminum Oxide a desirable material choice for a diverse range of applications. Aluminum Oxide is typically produced by extracting crushed Bauxite via the Bayer Process. Through various processes Aluminum Oxide has the related forms of Fused Aluminum Oxide, Calcined Alumina, Reactive alumina, activated alumina, and bubble alumina. Each of these forms of alumina vary in their distinct properties and have a wide range of applicable uses. Panadyne offers a full range of aluminas to meet your application. 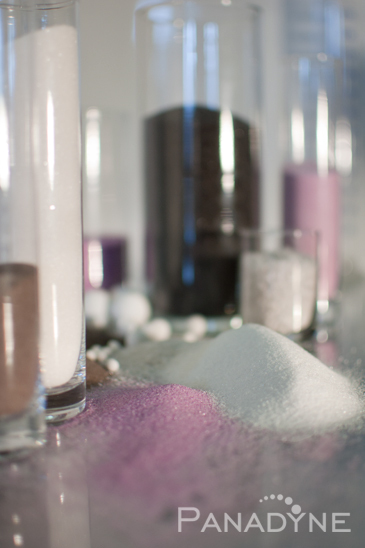 Our Aluminum Oxide is offered in standard or custom sizing as well as spheres. ©2018 Panadyne All Rights Reserved.